Photo courtesy Hannah Kauffmann and Erin Phillips. Self-Employed Happy Hour is back! 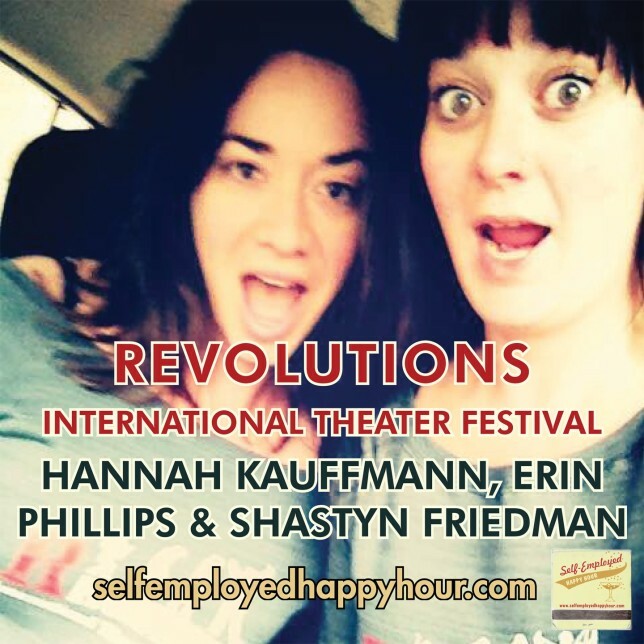 We stumbled through an incredibly fun 15 episodes last fall, took a month off to breathe, and kicked off our second season this week with a bang: with the organizers of the Revolutions International Theater Festival which just opened its three-week run in Albuquerque. Hannah Kauffmann, Erin Phillips and Shastyn Friedman of Tricklock Company took time out of their crazy busy schedules to come into the Pyragraph studio to talk about the insanity of pulling off an event of this magnitude, including all the normal complex logistics of a multi-venue festival PLUS the added joy of bringing dozens of international performers to town (with bonus denied visa trouble!). I had a blast chatting and drinking mimosas with these fun, badass women and getting insight into how they channel their amazing creative energies. Contributing Editors Josh Stuyvesant and Jeremy Kinter co-hosted. Listen below or download/subscribe to the podcast at iTunes, and leave a review while you’re at it! We’ll be announcing next week’s guest imminently so stay tuned!